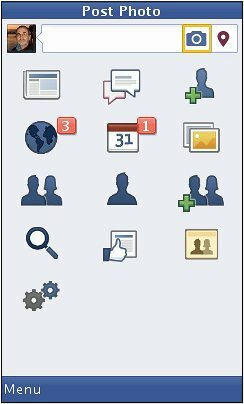 Here’s Facebook 3.3.1. In spite of the higher version number this doesn’t seem to be an upgrade to Facebook 3.3.0. Depending on which phone you visit the Facebook download site with you will either get 3.3.0 or 3.3.1. As far as I can tell the only difference between the two is that 3.3.1 lets you upload photos and 3.3.0 doesn’t. However 3.3.1 doesn’t work on nearly as many phones as 3.3.0. For the best version of Facebook for your phone, first try downloading from the official Facebook download page at https://d.facebook.com/install using your phone browser. If the Facebook site’s version doesn’t work or Facebook says your phone isn’t supported try the 3.3.1 version on this page. It it doesn’t work try Facebook 3.3.0. If 3.3.0 doesn’t work you are probably out of luck. Try downloading Facebook from https://d.facebook.com/install if that doesn’t work Facebook doesn;t support your phone. How to download this fb app.? how to download fb app?